MSc Architecture is a specialised programme designed to develop digital design and practical manufacturing skills. It builds on the ethos of rigorous and directed design studio tuition of LSBU’s established RIBA part 1 and 2 degrees. It also emphasises the value of detailed and analytical research and the expression of this through structured extended writing. You’ll extend your understanding of advanced architectural design and progressive contextual urbanism through studio- and workshop-based projects. 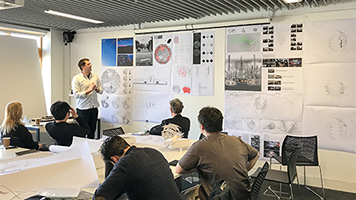 Tutorials in the design studio and analogue and digital workshops, as well as instruction in advanced design software, will help you define and enhance your personal response to architectural challenges. The course connects 2D and 3D representations (drawing and physical modelling) with an understanding of digital fabrication and manufacturing, and you’ll have the opportunity to develop and make architectural components using the onsite facilities of the DARLAB(Digital Architecture and Robotic Lab). You’ll also consider architectural history and theory, and evaluate this to develop your own position in the form of an extended written project on a subject of your choice. For your final design project you'll develop a proposition for a complex building or buildings, drawing together all your learning to highlight the relationships between theory, design and technology. We're ranked 1st for research intensity in Architecture amongst London modern competitors (Complete University Guide 2019). A written and illustrated technology report examining aspects of the constructional, environmental, and material implications of the major design project. Digital design and practical manufacturing skills are applicable to, and sought after in a very broad range of employment opportunities in architecture and other design-related activities, including visualisation, gaming, animation, media, production engineering, and industrial design. The course is not intended to lead to a professional qualification, although it reflects the criteria and graduate attributes used by RIBA to deliver their validation services to programmes in architecture. Curriculum developed to reflect (but not meet) professional and statutory body requirements. The course has been developed in consultation with employers interested in upskilling their workforce with enhanced digital design and manufacturing skills. The course has strong links with the Royal Institute of British Architects, Architects Registration Board, and South London Society of Architects, plus numerous local, regional, and national practices. Onur Ozkaya is a senior lecturer in architecture in the School of The Built Environment and Architecture. 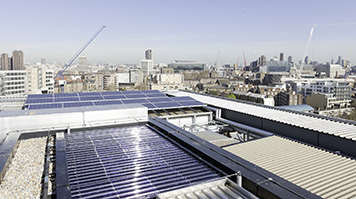 Teaching takes place in our dedicated Masters level studios, and makes use of LSBU’s specialist workshops; the Digital Architecture Robotic Laboratory, and Centre for Efficient and Renewable Energy in Buildings. You'll learn in a variety of formats including structured lecture programmes, 1:1 tutorials, small and large group seminars, and interim and final design juries with tutors and invited guests present. Exceptionally, an excellent first degree in a design-based subject closely related to architecture. The school is committed to a policy of inclusivity and opportunity, each application and applicant will be considered on the merits of their wish to learn, and to explore architecture at higher degree level. Suitable applicants to the course will usually be interviewed with their degree portfolio to understand their specific interests in architecture and disciplines related to architecture, and explore their further ambitions in architectural education.